My first view of Manipur’s Loktak Lake, from the aeroplane window, took my breath away. The surface of the lake—steel-grey in the morning light—was marked with perfect circles. Some were just rings, while others were filled out and larger, with tiny shacks on them. A few days later, I got a chance to see the floating islands in person. Known locally as phumdis, they’re formed by floating vegetation. Traditionally, fishermen would shape the vegetation into rings to help them fish. Today, they don’t need to, so the vegetation has been allowed to grow wild and often has to be dredged. Great piles of it lie drying in the sun by the lakeside. The guide told me it makes for great manure, especially for growing the vibrant mustard greens he buys from the town near the lake. On a boat ride through the lake, we rowed past phumdis of varying sizes, finally stopping near a substantial one. When I stepped on it at the guide’s urging, the spongy surface sank a little to let in some water around my feet. I started worrying, until the young man rowing the boat reassured me that it was normal. He is one of the around 4,000 people who live on the islands and phumdis on the lake. Instead of fishing, some of them now make their living ferrying tourists. Some work at the government-run water sports centre at one end of the lake, near Takmu. One of the biggest islands on the lake is India’s—and perhaps the world’s—only floating national park. Spread over 40 sq. km, the Keibul Lamjao National Park is rather like an iceberg, with 80% of it submerged under water. The tall grasses on it hide an elusive animal, the sangai, or brow-antlered deer, that is endemic to the area. Standing under the gazebo built at a viewpoint at the edge of the island, I scoured the landscape for a glimpse of it. The sangai is said to be so shy that the slightest sound or smell can frighten it away. The midday sun played tricks, making me believe I had spotted it each time the grass rustled in the languid breeze. I am still not sure whether the brown smudge I saw in the distance was a sangai or not, but it was a pleasant way to spend the day. 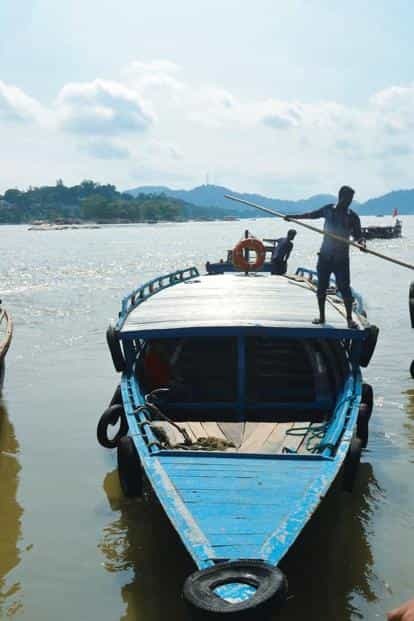 On the day I visited, the park boatman was on leave—if he is around, visitors can take a boat ride on the narrow channel running through the phumdis. I imagine it would be quite an experience. The national park and Loktak Lake are 60km south of the capital, Imphal. Taxi rentals for the day cost Rs3,500. In Kakkathuruthu, on the Vembanad Lake near Kochi in Kerala, visitors can experience nature at its best. Calming waters, an iridescent sunset, and after a quiet night lulled by gentle waves, waking up to a glorious sunrise bursting with promise. The island, in fact, is now world famous, after National Geographic listed it as the place to be at 6pm, in its photographic tour, Around The World In 24 Hours. It is so beautiful, with everything so still, that it sometimes feels as if time has stopped. You can ride the lake in a vanji (row boat), get a taste of village life or soak in the natural beauty. It is God’s own island and the perfect place to unwind. To get there, take a taxi from Cochin International Airport to Eramalloor Junction (45km away), or a taxi from the Ernakulam Junction railway station in Kochi to Eramalloor Junction (20km away). Near the Aroor toll on National Highway 47, turn left and drive for 1km till you reach the Kodumpuram Ferry. Hop on to a vanji to the Kakkathuruthu Island (a 10-minute ride). You can stay at the Kayal Island Retreat, an ecology-friendly resort, the only place to stay on the island. As the boat leaves the small man-made harbour, two small birds skim over the water. The boatman navigates between the nets set by local fishermen, setting a straight course towards Kalijai Island, barely visible on the horizon as a thin green line. 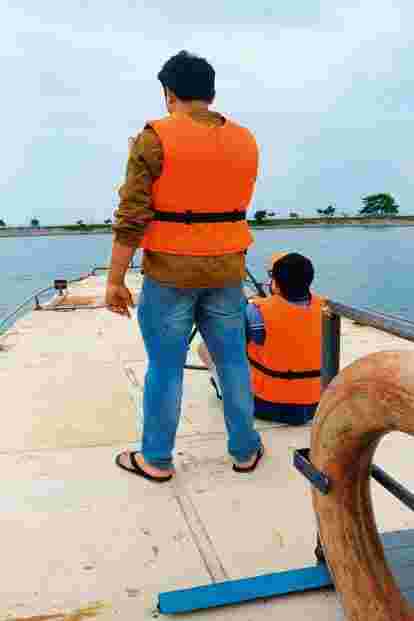 The surface of Chilika Lake, a large brackish waterbody that sprawls across three districts in Odisha, ripples gently in the morning breeze. The lake is so large that it has multiple access points. I take a boat from Barkul, the one closest to Bhubaneswar. The boatman suggests I keep an eye out for the Irrawaddy dolphin. I do, tempering my expectations. The dolphins are shy mammals, and with only about 134 of them in the lake, according to a 2017 census, the chances of spotting one are low. They’re usually seen around Satpada. Come winter, this lake is a wonderland for bird-spotting, especially around Mangalajodi, where an eco-tourism initiative organizes regular tours. I am here at the tail end of the monsoon, but there are still plenty of birds about. It isn’t long before the island comes into focus, the bright yellow of the Kalijai Temple visible from afar. The temple and the island are both named after the goddess Kalijai, believed to be a local who died in a storm on the lake soon after her wedding, while on her way to meet her husband. It is believed that she sacrificed herself to save her father and the boatman, thereby becoming the patron goddess of all those who travel on the lake. Tying some bright red bangles, bought from an adjoining stall, with a cloth strip to a post near the temple in honour of this legend, I set off on a quick stroll around the island. The path begins behind the temple, where I spot a foot-long chameleon in the midst of changing colour. I find several more hidden in plain sight during my walk, hugging a tree bark or resting among neon-green leaves. With the monsoon not yet over, the vegetation on the island is exuberant, with something green growing under, over and around every rock, and even between the blocks that pave the path. Scores of white butterflies flutter about, and occasionally the path turns to reveal a glimpse of the lake crashing against the rocks at the edge of the island. The roots of a hardy banyan cling to the rocky outcrop it stands on, somehow finding purchase in that inimical spot. Its sturdy branches are covered with initials carved by previous visitors. In just 20 minutes, during which I didn’t spot another soul, I’m back where I started, at the jetty near the temple. Few wander beyond this point, but I’m glad I did. The short walk was a reminder of one of the things I love about islands—the sheer variety they hold in their small land mass. The tout muttered Umananda, Umananda, Umananda as he walked past, almost hypnotizing me into taking his ferry to the small mushroom-shaped island in the middle of the Brahmaputra. I walked on. My grocery bags demanded I go home undistracted by mid-river detours. But the image of this tiny rocky outcrop in the middle of a swirling, angry river remained. I thought about the island during the monsoon, when the river gobbled up factories, villages and forests. I thought about it when the ferries disappeared from the waters and friends and family called to ask if I was safe—wasn’t all of Assam flooded? I wanted to say that there was at least one spot resisting the river; one island that allowed its plants and animals to stay safe and relatively dry. Umananda derives its name from “Uma" (another name for the goddess Parvati) and “ananda" (happiness). According to local legend, the island was created for Parvati’s pleasure, though, ironically, other tales associate the island with Shiva’s penance and the incineration of Kamadeva. History, however, dates the island’s temple to the 17th century, attributing its construction to an Ahom king. Two hundred years later, when the Assam earthquake of 1897 flattened the region, emptied lakes, created 7ft waves in the Brahmaputra and raised the neighbouring plateau of Shillong by 11m, the island remained strangely unaffected. Only the temple needed some reconstruction. Therefore, when a friend suggested a trip to Umananda with our families, I decided to go because I wanted a slice of that island’s spirit, to stay steady during the quakes and aftershocks of a parent’s life. The river was full, the monsoon was a fresh memory and the water had the strong grey-brown colour of silt. We stayed under the ferry’s makeshift metallic roof, trying to hide from a resurgent sun. The island came into view, with rocks and sand forming a collar around the green curly mop of the trees’ canopy. Instinctively, my hands reached out to stroke the baby curls on my son’s head and adjust the collar of his shirt. The bamboo dock looked fragile but proved safe, standing near an archway that marked the steps leading up to the temple. We began to hike, flanked on either side by huge fragrant flowers. Then came the langurs. I looked at the black faces of these golden langurs, and the yellow-orange fur that seemed to burst like flames from their bodies. What made these animals live in this isolated habitat, hundreds of kilometres from their natural range? Did they travel along with the carpenters and sculptors who worked on the temple centuries ago? Did someone leave a breeding pair on the island? Are they evidence of more recent mischief? I clutched the bag with our lunch closer. After a lunge and quick sniff, though, the langurs abandoned my idli and poha boxes for the packets of chips carried by the travellers ahead. Over the next hour, many of us puffed and panted to a stop. Open shrines along the stairway were good excuses to rest. We reached the dark, cavernous main sanctum after negotiating the long queue. Then we slouched our way back to the ghats. As we waited, some of the vendors joined us—they were making their way back to Guwahati. Only a clutch of people live on the island all year long. It can be surreal when the river growls and expands, and the murderous current leaves them marooned, even as Guwahati’s lights twinkle in the distance. Just then a friend interrupted my reverie, announcing that the trader who rebuilt the temple in the 20th century ensured that there were verses to Vishnu inscribed in the Shiva temple. I laughed a little at this microscopic act of subversion. The ferry arrived and we slowly slipped into silence. It had been a tiring journey, but when the families parted, the goodbyes were warm and spontaneous, as if we had been blessed by the spirit of Umananda Island. As a child, on train journeys crisscrossing south India, I was fond of throwing coins from my compartment window into the rivers that we passed over. It was considered good luck. The train from Mysuru to Bengaluru passed over two stretches of the Kaveri river, halting between them at the Srirangapatna railway station, but I don’t remember ever having thrown a second coin, or even harbouring the idea that Srirangapatna could be an island. Now the Bengaluru-Mysuru highway runs through part of Srirangapatna, and I have to use the satellite imagery on my mobile phone to prove to incredulous friends that Srirangapatna is indeed an island; the Kaveri diverges close to the point that a commemorative obelisk stands on the land mass, and converges towards the south-eastern edge, at the Triveni Sangama. Islands are often regarded as exotic, insular and mysterious, but Srirangapatna has always been accessible to the outside world, even with the fortification guarding the kingdom of Tipu Sultan and enclosing the Ranganathaswamy Temple. Today, not much remains of Tipu’s Lal Mahal palace, but on a previous visit to the exquisitely frescoed Daria Daulat Bagh, I listened to a security guard’s impassioned narration of how Tipu surrendered two of his sons as hostages of war to the British, under a painting depicting the scene. Later, an inebriated tour guide at Colonel Bailey’s dungeon described in graphic detail how Tipu tortured and held his prisoners captive below ground level, in cells that would be flooded with the waters of the nearby river. On my most recent visit, I went to the Ranganathaswamy Temple, one of the points in the Tri-Ranga Darshanam, the pilgrimage of the three Ranganatha temples that are located on islands in the Kaveri. The devout in my family have attempted worshipping at all three temples in the span of a single day, between sunrise and sunset. This temple complex is perhaps the oldest structure on the island. The town that evolved around it came to be known as Srirangapatna (Sri Ranga’s town). Even the bird sanctuary upstream, Ranganathittu, is named after the deity here. I am an unlikely pilgrim, yet my hackles rose as I entered the temple precincts through the gopuram (gatehouse tower) on a late October morning. The stone doorway has been narrowed with cement columns, with scant regard for the way this mars the ancient dwarapalakas, the doorkeeper statues, that stand on either side. A tourist guide in the inner courtyard of lathe-turned pillars narrated the story of the temple to a bunch of schoolchildren. While the original garbha griha, or sanctum sanctorum, was built in 817 AD, reportedly by a dancer, all those who came subsequently, from Ganga dynasty chieftain Thirumalaraya to Hoysala king Vishnuvardhana, and even Hyder Ali and Tipu Sultan, added to it. The sanctum sanctorum was surprisingly quiet. I paused in a corner, awed by the Ranganatha, who is depicted on a massive scale, reclining with a hand propped under his head. Ranganayaki, a manifestation of goddess Lakshmi, has her own shrine, where a young priest narrated her story. In the early 1600s, the representative of the Vijayanagara kingdom, Sriranganatha, died of a mysterious ailment. His wife, Alamelamma, continued the weekly tradition of sending jewellery to adorn the deity. When Raja Wadiyar, who had taken over the kingdom, heard, he insisted that she surrender the jewels. Uttering a curse, Alamelamma drowned herself in the Kaveri. Ever since, it is said, Alamelamma’s pearl ring, which is still used to adorn the goddess, diminishes in size each year. I passed rose farms en route to the Nimishambha temple in the island’s north-eastern corner, the roads lined with vendors in makeshift stalls selling gulkand. The temple is on the river bank, close to where the Lokapavani tributary joins the Kaveri. Two elderly men on the banks sound gongs for a fee. The enclosures extending from the ghat are strewn with the detritus of ritual dips, but the river is wide here and flows steadily. The Paschima Vahini ghat is located in a disorienting spot between the island and the mainland, just off the highway. It’s hard to say where the island ends and the mainland begins because one loses track of the very things that define a riverine island—the waters that sometimes gush within sight, and sometimes flow along unobtrusively, and the many bridges, some spanning an immense width and some that one passes over distractedly, so lost in the gathered stories that one forgets to toss a second coin over the edge. Sunlight danced through mist and cloud, and there was a nip in the February air as we made our way to Kakinada Port, less than 2km from where we were staying—Haritha Beach Resort, an Andhra Pradesh Tourism Development Corporation hotel. The harbour bustled with fishermen wheeling carts full of tawda. Cargo ships carrying rice, palm oil, spices and granite lined the cerulean waters of Kakinada Bay, which merges with the Bay of Bengal. From the port, we took the tourism department’s 30-seater boat to Hope Island, a 45-minute journey. A kilometre away from the jetty at Kakinada was a 500m-long and 60ft-deep barricade of boulders that keep ocean waves from entering the shipyard. Our boat made an arch around the barrier, heading towards Hope Island. Famous for its natural and hybrid mangroves, and formed 200 years ago from the sediment outflow of the Koringa River, a tributary of the Godavari, the island gets its name, Hope, from the protection it provides Kakinada. It acts as a natural barrier against tsunamis and cyclones, making Kakinada one of the safest natural harbours on India’s east coast. The island’s two hamlets, Putrayya Pakalu and Sorlagondu Pakalu, are inhabited by 400 families of fisherfolk. The villages run on solar power, and there is a government school. Alighting at the island’s jetty, we wove our way through sandy paths before coming upon the mangroves. Tourism is nascent, with not many facilities to talk of, but the beaches and the neighbouring Coringa Wildlife Sanctuary are a breeding ground for Olive Ridley turtles. A few hundred come to these shores each year, during the mating season in October-November. Six weeks later, as if on cue, the hatchlings wend their way back to the Indian Ocean. In February, there were no turtles, but we did see beautiful orange crabs emerging from their coiled shells. We walked through endless clusters of brilliant green, catching stunning views of the backwaters, before reaching the sanctuary. Named after the river winding through it, the sanctuary has the largest mangroves in India after the Sundarbans. These hold an amazing variety that includes several turtle species, the Indian smooth-coated otter and the saltwater crocodile. Walking through the trees, we spotted a bushy tail here, a quick scamper there. On the journey back at dusk, the sky was alive with avian drama. As our ferry approaches the pristine beach of the Thinnakara atoll in Lakshadweep, I cannot help but marvel at the colour of the sea, turning from azure to turquoise before turning pale blue as its waves caress the coral dust of the shore. A pair of turtles swim nonchalantly amid the flamboyant corals. It is late afternoon. The tide in the lagoon has gradually ebbed, exposing the tips of some of the corals. The water is pristine here. As our boat carefully navigates the shallow lagoon, avoiding contact with the corals, the vibrant creatures of the seabed spring to life. Thinnakara looks near deserted save for a few tourists and the resort staff. Accommodation on the island is basic: just nine Swiss cottage tents with attached baths. But you forget all that soon enough. The rustle of the swaying coconut palms and the soft roar of the waves in the lagoon form a symphony with the plaintive cries of the seagulls. The pristine white sand of the beach, formed by the erosion of coral skeletons, sparkles like silver in the afternoon sun. As twilight swaddles the island, spreading its amber hues, I set out to explore. The tide has receded further, exposing a vast expanse of the white seabed. A new world seems to have emerged from the water. Walking barefoot on the wavy patterns of the coral sand left behind by the receding tide, I discover numerous sea cucumbers, starfish, shells and corals. The exposed seabed is just as beautiful. It only takes an hour to go around the island, which has a total surface area of 0.42 sq. m.
Unlike Lakshadweep’s tourist islands, there is no solar-power plant in Thinnakara, so a diesel generator is the only source of electricity. No network connectivity, nothing but a sense of endless time as you luxuriate in nature. While dropping off to sleep on the soft sand, I can see just about every constellation in the clear night sky—there isn’t a single puff of cloud. I drift into a gentle slumber, pampered by the cool breeze, and am only woken when waves touch my feet as the tide begins to rise. Lakshadweep has two uninhabited islands that tourists are allowed to visit. Thinnakara and Bangaram. The coral islands of Lakshadweep are extremely fragile and ecologically sensitive, so the government restricts entry. While you’re there, you can scuba dive, snorkel, or take a glass-bottom boat ride. Take a flight from Kochi to Agatti Island. From there, it takes about an hour and a half by speedboat to Bangaram Island, followed by a ferry ride of about 30 minutes to Thinnakara.